The model for today’s health insurance systems was Otto von Bismarck’s compulsory health insurance, introduced in the German Empire in 1884. This column uses contemporary mortality data to show that, by extending access to healthcare, Bismarck’s health insurance significantly reduced mortality rates for blue-collar workers, probably by increasing the public’s knowledge about communicable disease transmission. This supports theories about the fundamental role of hygiene in reduced mortality at this time. The United Nations’ Sustainable Development Goals commit members to achieving universal health coverage by 2030. Success could massively improve health, while reducing out-of-pocket spending. This spending averages 32% of expenditures on health services (WHO 2014). Many developing countries are experimenting with compulsory health insurance models (Lagomarsino et al. 2012, Miller et al. 2013). Although large informal sectors make these schemes hard to organise, they decrease out-of-pocket spending by extending access to health services and preventive services. This is important in places with high prevalence of infectious diseases such as HIV, malaria, and tuberculosis. In the US, Medicare for the elderly and Medicaid for the poor have extended coverage to subgroups of the population. These programmes resulted in significant improvements in healthcare utilisation and health outcomes (Card et al. 2008 and 2009, Currie and Gruber, 1996, Finkelstein 2007, Finkelstein and McKnight 2008, Goodman-Bacon 2017). While we await more comprehensive evaluations of the 2010 US Affordable Care Act (known as ‘Obamacare’), we can learn from earlier large-scale implementations of universal healthcare schemes. In December 1884, Otto von Bismarck, Chancellor of the German Empire, introduced the first large-scale compulsory insurance to establish universal healthcare. For the first time in history, all blue-collar workers were covered by an insurance that provided paid sick leave and unrestricted access to doctors and medical treatment. Bismarck’s original intentions were not genuinely social. His health insurance was a reluctant reaction to upheavals among the working class in the wake of the Industrial Revolution, and a way to secure a political advantage against the Socialist Worker’s Party in the Reichstag, Germany’s parliament. Bismarck’s clever design ensured that the imperial budget was not affected. It was jointly financed by employers (one third) and employees (two thirds). The scheme served as a blueprint for others. Even today, many health insurance systems are based on Bismarck’s health insurance. But although researchers agree that this was an important milestone for the development of social insurance systems, they don’t agree about how successful it was. In recent work, we investigate the impact of Bismarck’s health insurance on mortality (Bauernschuster et al. 2017). We build our main analysis on administrative mortality data from Prussian districts between 1875 and 1905. Prussia was two-thirds of the German Empire, and had a statistical office that collected and reported data on mortality by occupational group. Combined with the imperial occupation and population censuses, this lets us calculate occupation-specific mortality rates at the district level. When insurance was introduced in 1884, it was compulsory only for blue-collar workers (our treatment group). Access to healthcare was unchanged for other occupational groups such as public servants (our control group). Comparing mortality rates across both groups before and after 1884, we identify the impact of Bismarck’s health insurance on mortality (Figure 1). Notes: The figure shows the number of deaths per 1,000 people by sectoral groups of blue-collar workers and public servants. 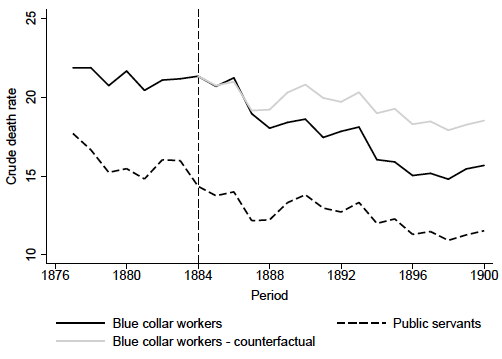 Using difference-in-difference, the counterfactual is computed by parallel-shifting the trend of the public servants up to the blue-collar workers level in 1884. The vertical dashed line indicates the introduction of Bismarck’s health insurance in 1884. A generalised difference-in-difference method suggests that Bismarck’s health insurance reduced blue-collar worker mortality. Blue-collar workers and public servants followed very similar mortality trends prior to the introduction of compulsory health insurance. Soon after 1884, mortality rates for blue-collar workers declined much faster than the mortality rates for public servants. By the end of the 19th century, the reduction was almost 9%. Much of this decline was driven by the children of the insured, indicating significant within-family spillovers to uninsured family members. The effect of Bismarck’s health insurance on mortality turns out to be very robust. Sanitation infrastructure such as sewerage systems and waterworks improved around this time, and urbanisation tendencies or improved working conditions for blue-collar workers could also confound the effects, but we rule them out. We are also able to show that healthier individuals were not taking blue-collar jobs. To gain a deeper understanding, we look at data on the causes of death in Prussia. They imply that the decline in airborne infectious diseases mortality was driven by a decline in communicable airborne diseases, in particular tuberculosis. They were the main causes of death at that time, a situation similar to many developing countries today. Medical treatment was, nevertheless. limited. Antibiotics would not be widely used until the 1940s and many important vaccines were not available, and so the significant reduction of infectious disease mortality in the blue-collar population is surprising to see. Results based on data from aggregate sickness-fund balance sheets suggest that the mortality reduction is primarily associated with expenditures for doctor visits and medical treatment, but not with sick pay. Bismarck’s health insurance probably achieved improvements in health outcomes because it provided low-income households with unlimited access to doctors that they were formerly unwilling or unable to consult. Poor worker families gained access to the newly emerging medical knowledge on the transmission of communicable diseases, the fundamental role of hygiene for preventing infections, and health procedures that became available at the end of the 19th century. This research helps establish the causes of the mortality decline during the historical demographic transition at the turn of the 20th century. Proponents of the nutrition view (McKeown, 1979, Fogel 2004) have argued that changes in income and standard of living most important, whereas proponents of the public health view (Deaton 2013, Preston 1975, Cutler and Miller 2005) argued that directed investments in public health infrastructure, and the application of public health knowledge, as driving forces. Paid sick leave may have reduced financial risk, stabilised nutritional intake and thus improved the health status of insured in the long run, but the immediate benefits of Bismarck’s health insurance worked largely through the prevention of infectious diseases. The diffusion of hygiene knowledge to the working class was probably crucial at a time when treatment by medication was still limited. We can even argue that compulsory health insurance that focused on disease prevention through hygiene education would have been more cost-efficient. On the other hand, Bismarck also desired social peace, and this form of heal insurance may not have promoted this political objective. Bauernschuster, S, A Driva, and E Hornung (2017), “Bismarck's Health Insurance and the Mortality Decline”, CEPR Discussion Paper No. 12200. Card, D, C Dobkin, and N Maestas (2008), “The Impact of Nearly Universal Insurance Coverage on Healthcare Utilization: Evidence from Medicare”, The American Economic Review 98(5): 2242-58. Card, D, C Dobkin, and N Maestas (2009), “Does Medicare Save Lives?“, The Quarterly Journal of Economics 124(2): 597-636. Currie, J and J Gruber (1996), „Health Insurance Eligibility, Utilization of Medical Care, and Child Health“, The Quarterly Journal of Economics 111(2): 431-466. Cutler, D M and G Miller (2005), “The Role of Public Health Improvements in Health Advances: The 20th Century United States“, Demography 42(1): 1-22. Deaton, A (2007), “Height, Health and Development“, Proceedings of the National Academy of Sciences of the United States of America 104(33): 13232-13237. Finkelstein, A (2007), “The Aggregate Effects of Health Insurance: Evidence from the Introduction of Medicare“, The Quarterly Journal of Economics 122(1): 1-37. Finkelstein, A and R McKnight (2008), “What did Medicare do? The initial impact of Medicare on mortality and out of pocket medical spending“, Journal of Public Economics 92(7): 1644-1668. Fogel, R W (2004), The Escape from Hunger and Premature Death, 1700-2100: Europe, America, and the Third World, Cambridge University Press. Goodman-Bacon, A (2017), “Public Insurance and Mortality: Evidence from Medicaid Implementation“, Journal of Political Economy, forthcoming. Lagomarsino, G, A Garabrant, A Adyas, R Muga, and N Otoo (2012), “Moving Towards Universal Health Coverage: Health Insurance Reforms in Nine Developing Countries in Africa and Asia“, The Lancet 380(9845): 933-943. McKeown, T (1979), The Role of Medicine: Dream, Mirage, or Nemesis? Oxford: Basil Blackwell. Miller, G, D Pinto, and M Vera-Hernández (2013), “Risk Protection, Service Use, and Health Outcomes under Colombia's Health Insurance Program for the Poor“, American Economic Journal: Applied Economics 5(4): 61-91. Preston, S H (1975), “The Changing Relation between Mortality and Level of Economic Development“, Population Studies 29(2): 231-48.
WHO (2014), The World Health Report 2013: Research for Universal Health Coverage, World Health Organization.